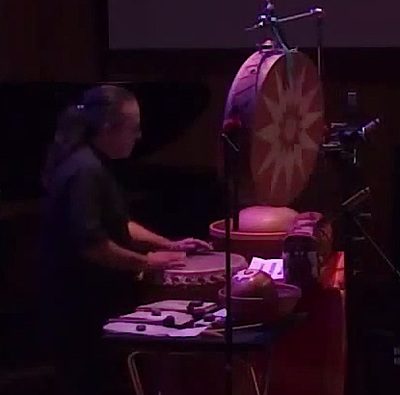 A native of(East) Los Angeles, Christopher attended California Institute of the ARTS on a full scholarship where he studied percussion with John Bergamo, and tabla with Pandit Taranath Rao, Leonice Shinemann, and Swapan Chaudhuri. Since then he has performed on 5 continents in 29 countries. His drumming and compositions are unusual in that they incorporates various vernaculars, rhythms and their permutations, along with a fluency with odd time signatures and sonic textures, which he seamlessly incorporates into his performances. Australia, Austria, Belgium, Bosnia, Brazil, Canada, Costa Rica, Croatia, the Czech Republic, Denmark, England, France, Germany, Holland, Hungary, Italy, Korea, Macedonia, Mexico, Norway, Serbia, Slovakia, Slovenia, Spain, Switzerland, the United States and Wales. acknowledged as an excellent educational overview to these instruments, their histories and performance practices. His lectures have been described as “educational, elevating, enriching and life changing.” by various audiences. With over 20 years experience in both the harp and the violin, Tasha Smith Godínez is an accomplished musician and educator. Ms. Smith Godínez debuted as a soloist at age 16 and has since graced stages worldwide. Ms. Smith Godínez began her musical studies at age 4 on the violin and age 8 on the harp. With the harp, Tasha has studied with Isabelle Perrin, Elena Mashkovtseva, and Susan Allen. She graduated with honors from San Diego State University where she obtained a Bachelor's degree in harp performance (2005). Upon graduation from SDSU she moved to Paris, France to study with the world renowned harpist Isabelle Perrin at L'Ecole Normale de Musique de Paris. In Paris, she also finished with honors when she obtained the only unanimous vote from the jury. Ms. Smith Godínez received a Diplôme de L'Execution de la Harpe (French equivalent of a master's degree in harp performance) from L'Ecole Normale de Musique de Paris (2006). Tasha has also received a master’s degree in harp performance from San Diego State University (2010). Ms. Smith Godínez frequently performs with the Orquesta de Baja Californian located in Tijuana, Mexico and the Grossmont Symphony of San Diego, California. In addition to her orchestral performing she is an avid soloist and chamber musician. 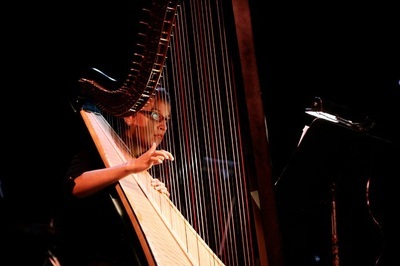 Ms. Smith Godínez specializes in the performance of new music for the harp. Recent accomplishments include a recording of Elliott Carter's Luimen, premiere performances as soloist and chamber musician and an invitation as soloist in the Mexico International Harp Festival (2012). Ms. Smith Godínez performs extensively throughout southern California and Mexico and has performed throughout Europe including concerts in: France, Germany, Czech Republic, Hungary, Austria, and Slovakia. Some of her notable performance venues include: Copley Symphony Hall (San Diego), San Diego Organ Pavilion (Balboa Park, San Diego), Escondido Center of Performing Arts (Escondido, CA), Dvorak Concert Hall (Prague, Czech Republic), L’Ecole Normale de Musique de Paris (Paris, France), and the Centro Cultural de Tijuana (Mexico). Ms. Smith Godínez' most recent projects include organizing the commission of a suite for solo harp, by Argentine composer Andrés Martin (premiered May 2013) and the recording of Andrés Martin's Concerto for Bass and Orchestra. Tasha is the recipient of a grant from the American Harp Society in order to commission a piece for solo harp by American composer Michael Byron. Aside from performing, Ms. Smith Godínez is president of the American Harp Society, San Diego Chapter and harp teacher for the San Diego Harp Academy. "During her stay in Paris, I would like to say how much I enjoyed working with her. Tasha has a very warm personality and is a very talented performer. Her playing is very musical and strong all together and so makes it really interesting to listen to. I wish her the best success in life with her harp, making all the people listening to her most happy"
"What a surprise to listen to such beautiful playing when you just attend a private friendly meeting. Tasha Smith caught my attention with her musicality and her technique. She became the most important event of the afternoon. Young, beautiful and elegant, I am sure she will soon be requested by symphonic orchestras, also for solo performances. She deserves to be helped in the beginning of her career." "I had the pleasure of hearing Tasha Smith play one afternoon while walking through the lobby of the Westgate Hotel. I had to stop and hear this beautiful lady perform. Her tone and style was so crafted and technically smooth. Not since Alice Chalifoux have I heard the harp played with such flash and musical understanding. She is terrific. Her range of playing covers all from "pop" to classical works. Give yourself a treat and do hear this fine musician play."